The Stanley Twins, F.E. 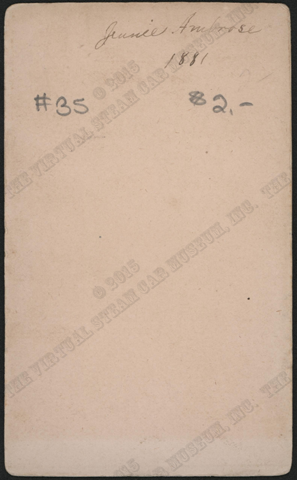 and F.O., engaged in the photography business prior to making the Stanley Steam Car. 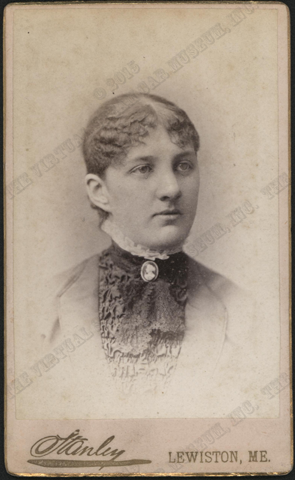 F. E. Stanley opened a photographic business and sold portraits door to door in Auburn and Lewiston, ME, before opening a studio in Lewiston in 1876 or 1877. 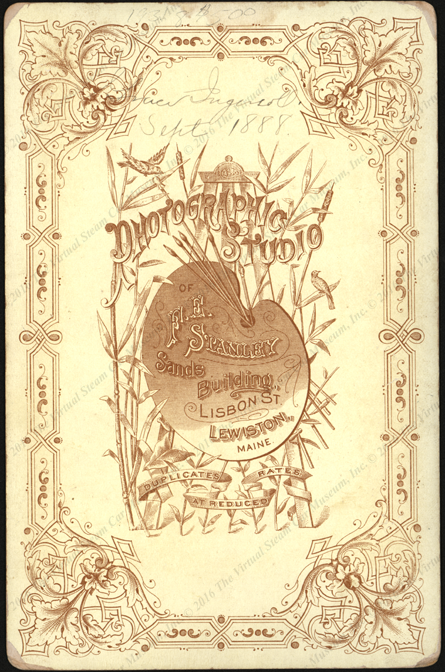 They closed the studio when their dry plate business grew and they needed access to the amenities of a major city. 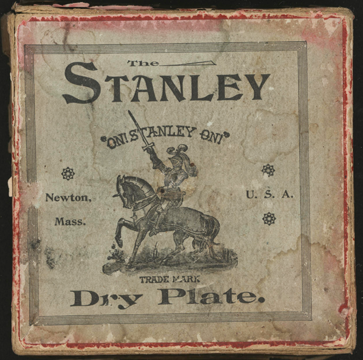 The Stanleys moved to Newton, MA in 1890, and created the Stanley Dry Plate Company. 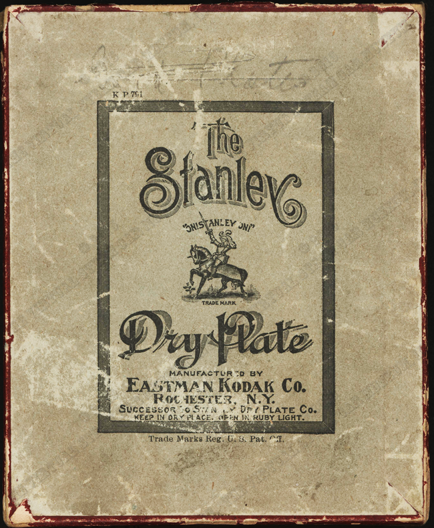 This page documents the style of printing on the Stanley's Auburn and Lewiston, ME images and the variations of Stanley Dry Plate boxes. 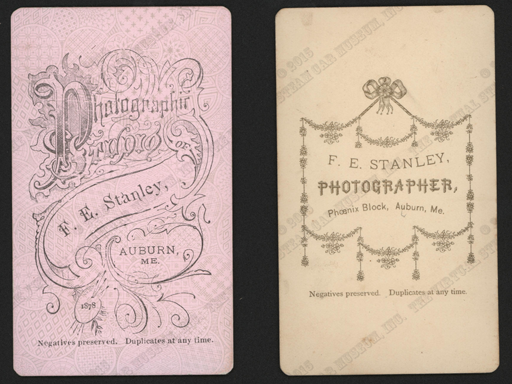 These two images carry F. E. Stanley's name as well as his address, Phoenix Block, in Auburn, ME. 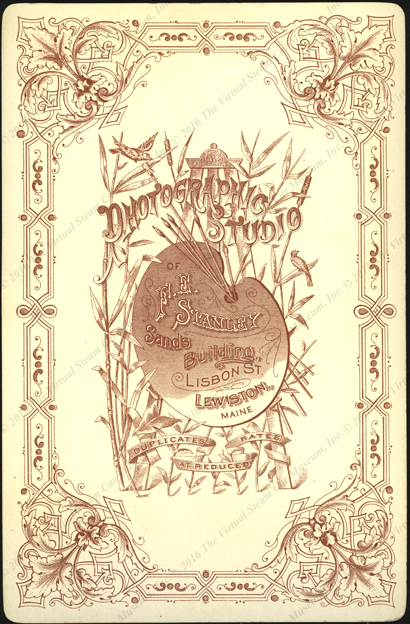 This image carries a different type style than the script seen above. It was produced in Auburn, ME. This image carries both the Lewiston and Auburn locations. 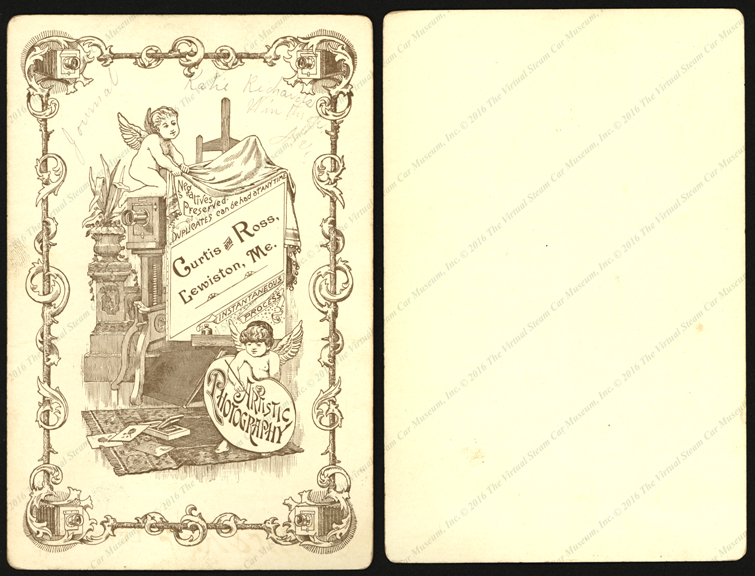 This image carries the Lewiston location, but the handwritten information the back reads "Journal Hather Smith Auburn ME." 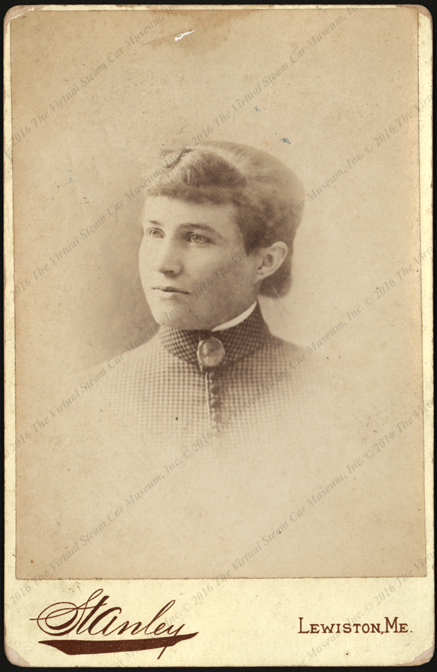 This suggests that either the subject came to Lewiston to be photographed or that Hather Smith was photographed in Auburn but her image printed in Lewiston. 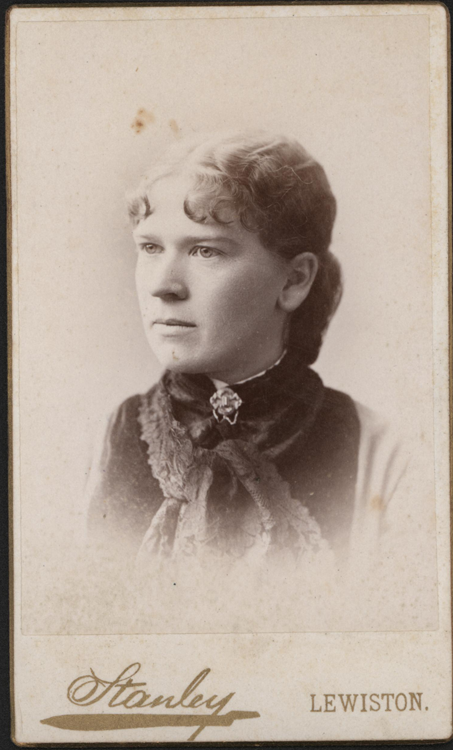 This image is dated 1881 and is identified as Jennie Ambrose. 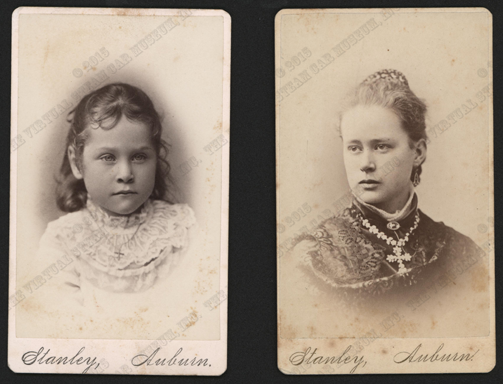 Carte de Visite examples of the Stanley's Studio, Lewiston, ME. 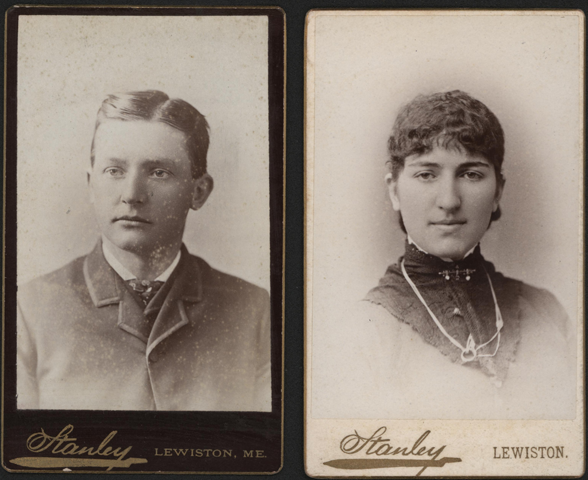 These two photos were identified by the dealer who sold them as a husband and wife. There is no documentation to support this assertion. 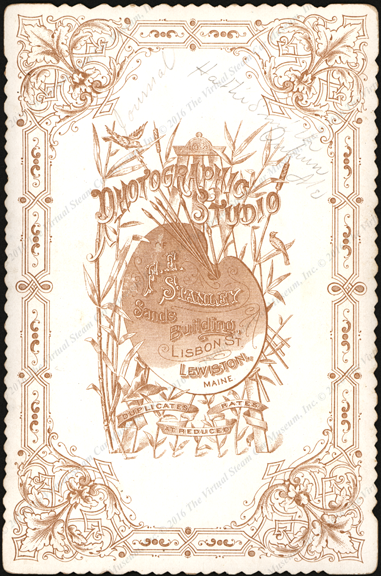 This image is dated 1886 in black ink on the reverse. 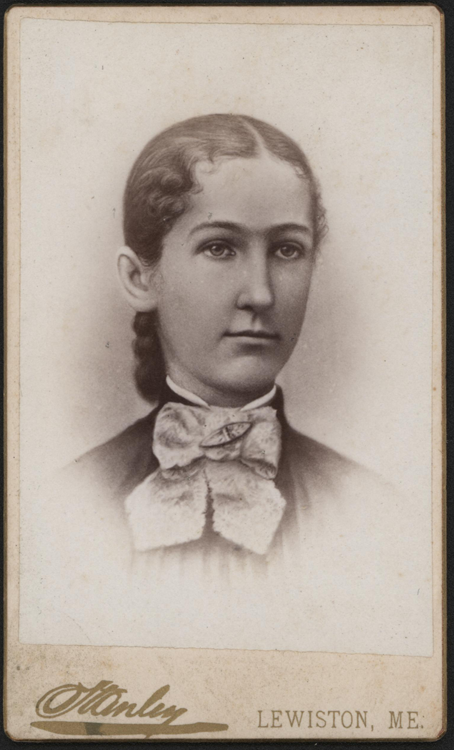 Otherwise no information about this lady. 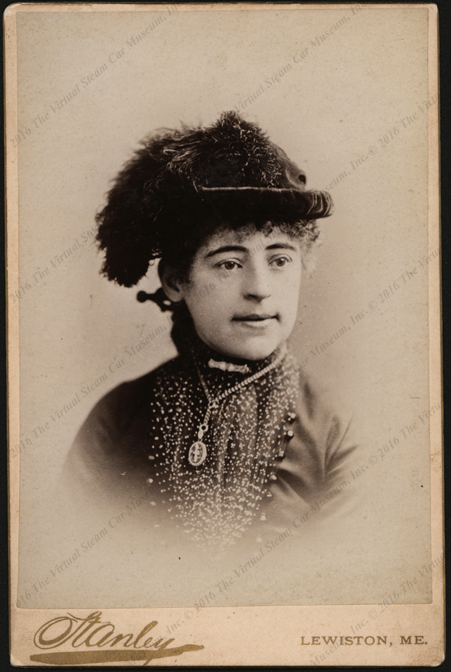 This unidentified cabinet card and the card below measure 4.25" x 6.50" and is adorned on the reverse with a magnificent bit of Victorian advertising. They were acquired separately. 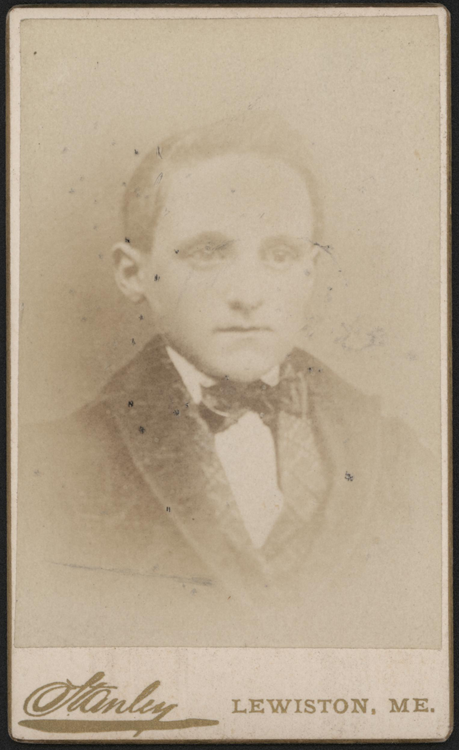 This Lewiston image is dated September 1888 and carries the name "L____ Ingersoll". 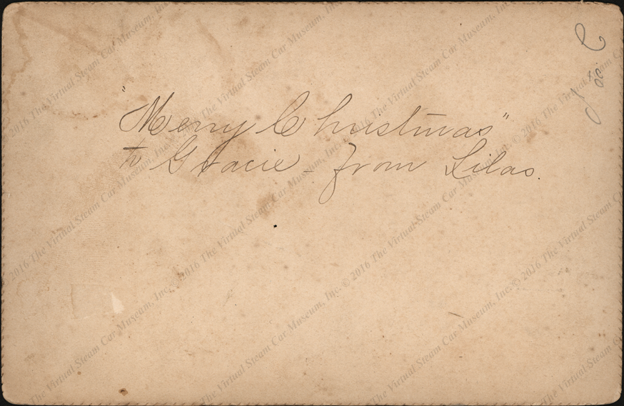 This image carries the inscription "Merry Christmas to Gracie from Lilas." This image carries no incsription. This image carries no incsription. It was shared with the VSCM by an anonymous correspondent. Jim Merrick, a phenomenally tallented researcher, shared information he found about the "bird lady." This image is an original Stanley photography that has been changed through an "artistic intervention" by the artist Sara Angelucci. 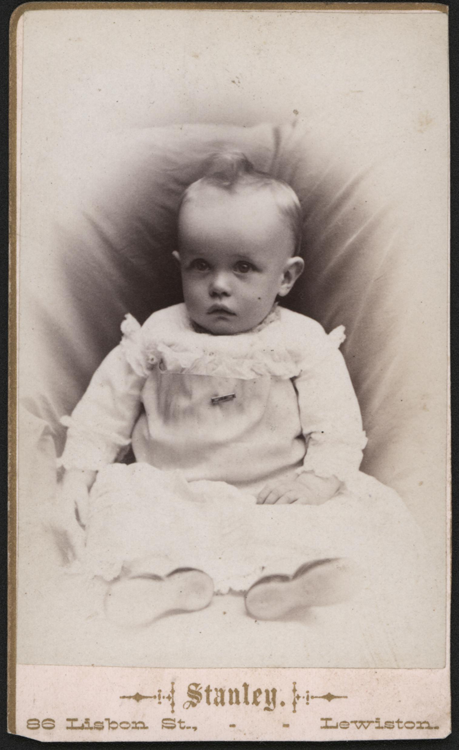 The artist used several other Stanley photographs as well as images by other photographers. One was Curtis and Ross of Lewiston, ME, undoubtedly a Stanley Competitor. 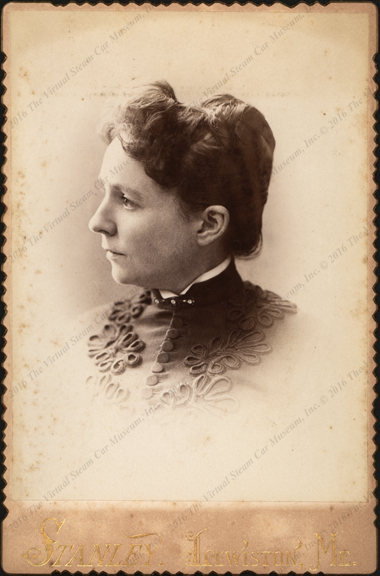 Another image was taken in "Seattle, W.T." and another came from Norfolk, VA. This image is identified as a "red-headed woodpecker." Jim Merrick remarks, "I bet the Stanleys would have gotten a real kick out of it." No doubt! 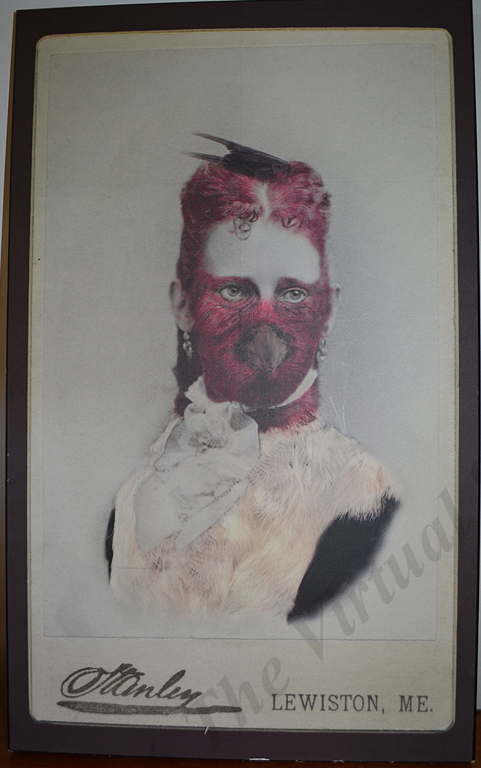 Sara Angelucci is a Candadian artist who created an exhibition entitled "Sara Angelucci's Haunting Bird People." "By intervening a series of photographs, this Canadian artist tells us of the Victorian spirit and defends the life and memory of some birds in North America." 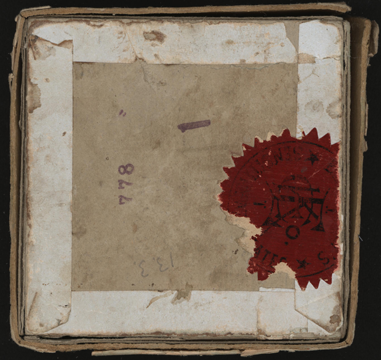 The web page carries the following title: "August 25, 1016, By Lucia Ortiz Monasterio, Posted in: Eccentricity." 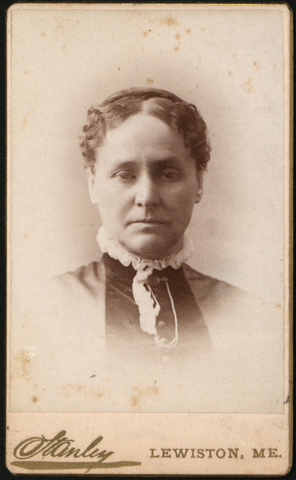 These two images were acquired with the Hather Smith image above, apparently coming from the same source. 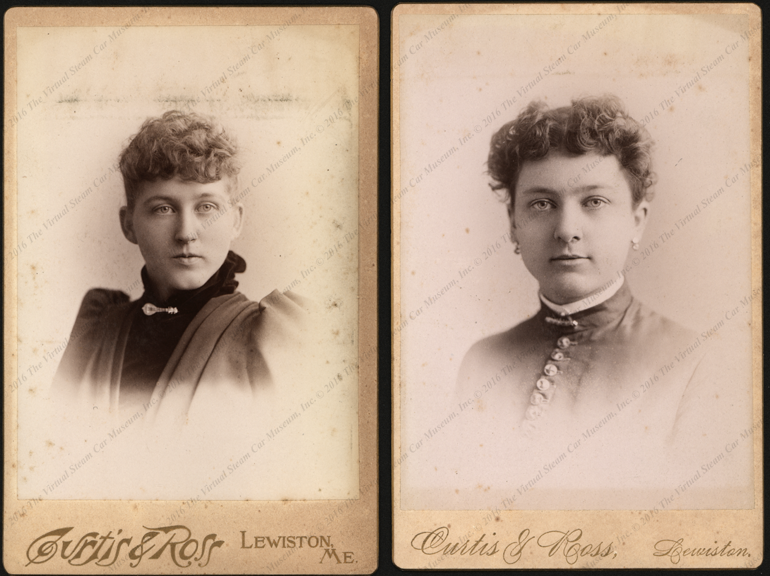 Curtis and Ross were apparently competitors to F. E. Stanley in Lewiston, ME. 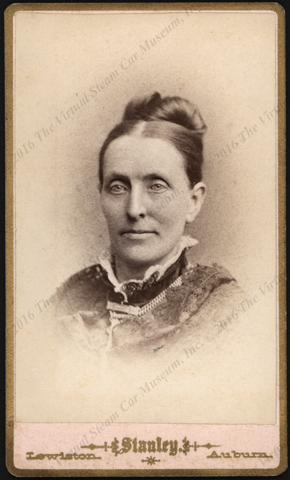 The lady at the left is identified as Katie Richards of Winthrop, ME. 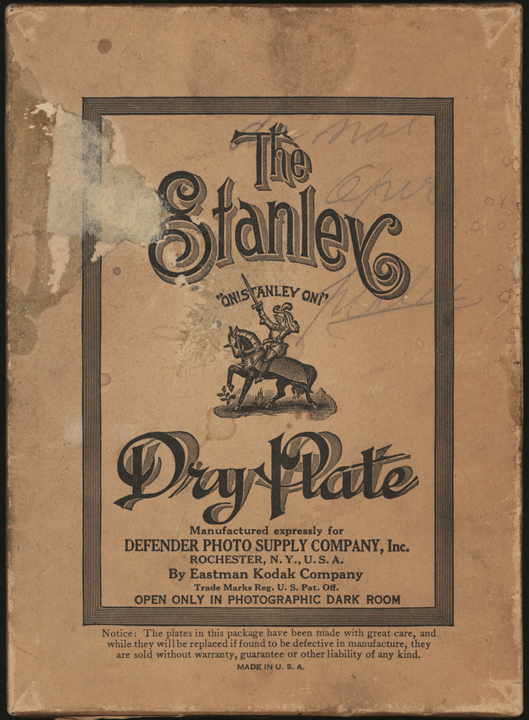 This Stanley Dry Plate box holds 5" x 7" negatives. Three survive in their original paper sleeves. 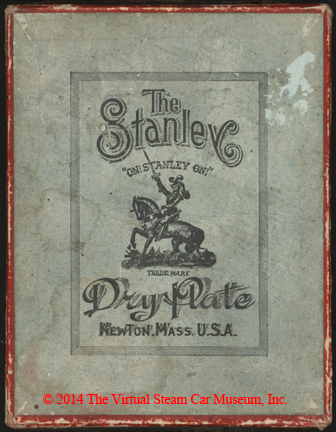 This Stanley Dry Plate box carries the Newton, Mass. location. 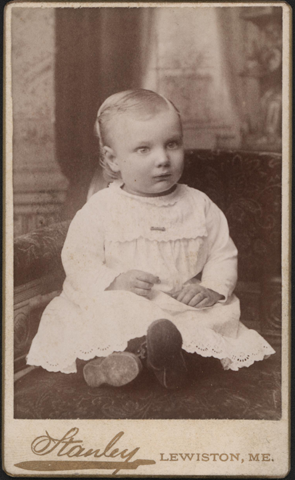 Its glass plate negatives were 3 1/2" x 3 1/2". 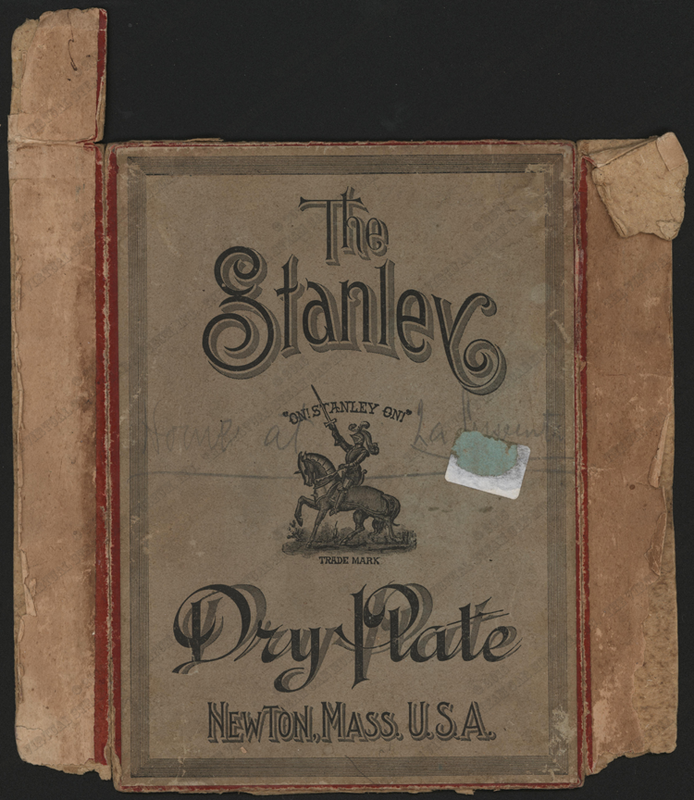 This Stanley Dry Plate box carries the Newton, Mass. location. 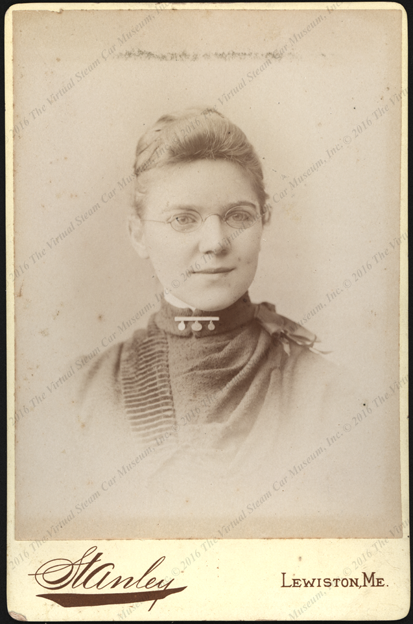 Its glass plate negatives were 3 9/16" x 4 3/4". 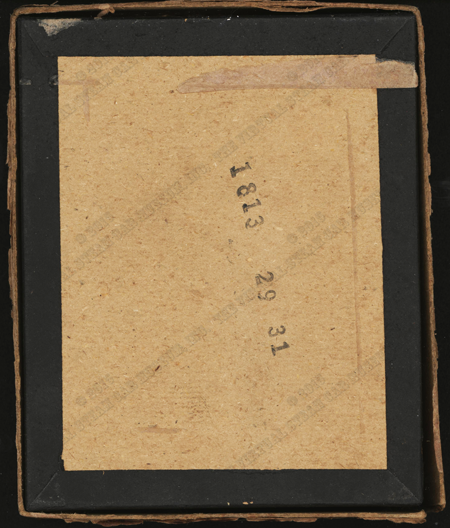 This Stanley Dry Plate box is filled with 4" x 5" galss negatives. 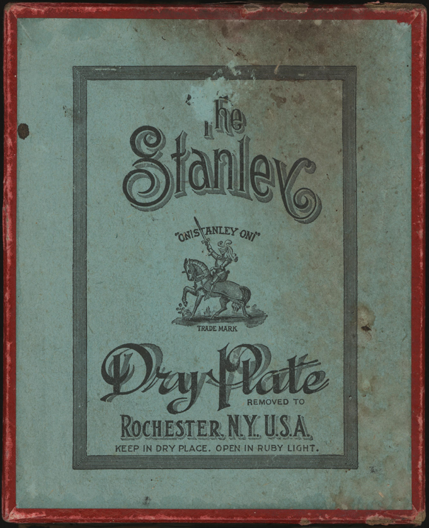 These two Stanley Dry Plate boxes were produced very shortly after Kodak acquired the Stanley business. 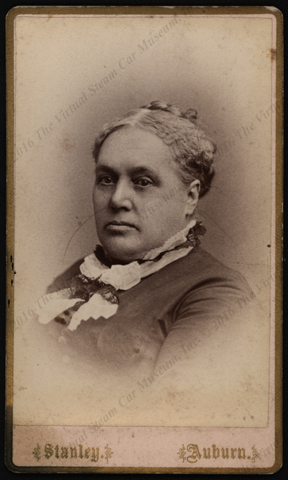 Note the inscription: Successors to the Stanley Dry Plate Co. 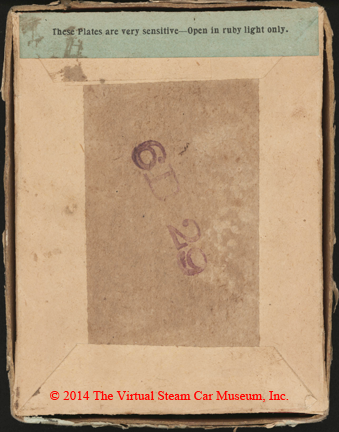 This Stanley Dry Plate box was filled with 4" x 5" negatives. 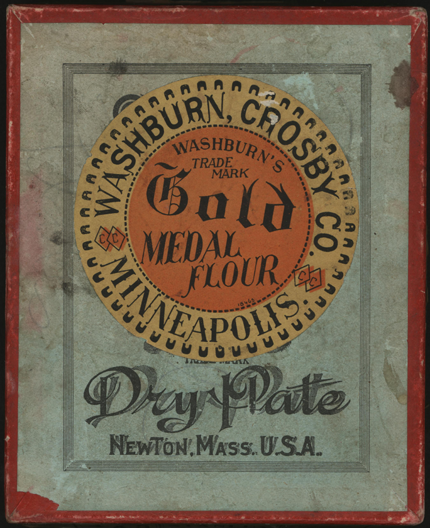 Note the inscription: Successors to the Stanley Dry Plate Co. 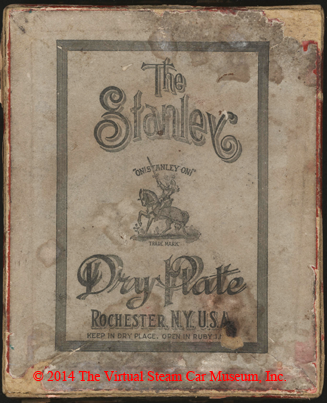 This Stanley Dry Plate box carries tne note REMOVED TO ROCHESTER, N.Y.. 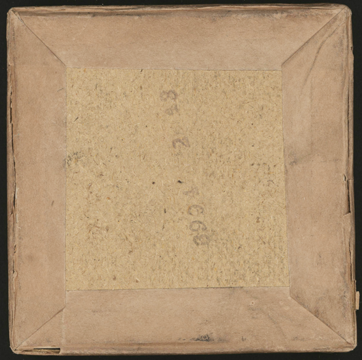 It is filled with 4" x 5" glass negatives. 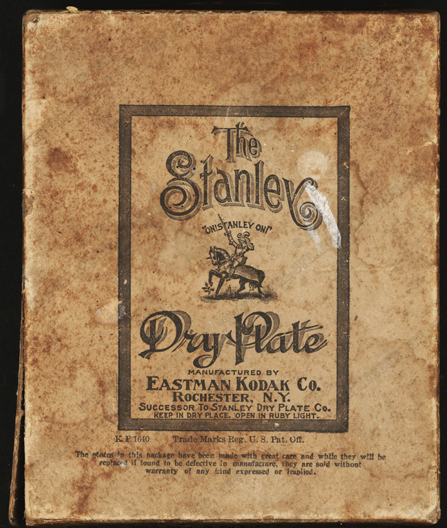 This Stanley Dry Plate box was never opened and still contains its unexposed 3 1/2" x 3 1/2" dry plates. 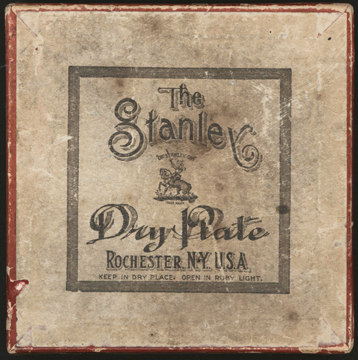 This Stanley Dry Plate box was made by Kodak for the Defender Photo Supply Company of Rochester, NY. Size: 5" x 7" dry plates. 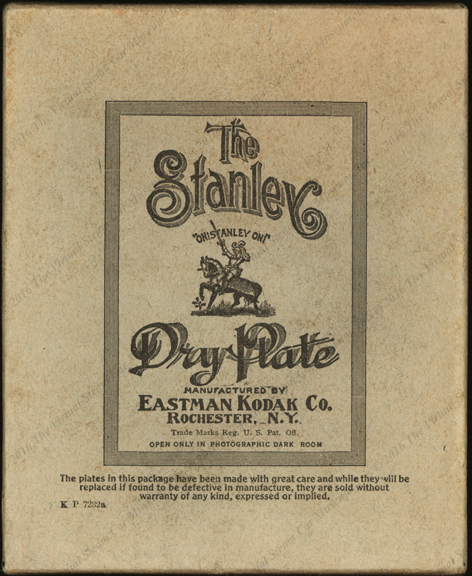 This Stanley Dry Plate box was made by Eastman Kodak Company of Rochester, NY. Size: 4" x 5" dry plates. 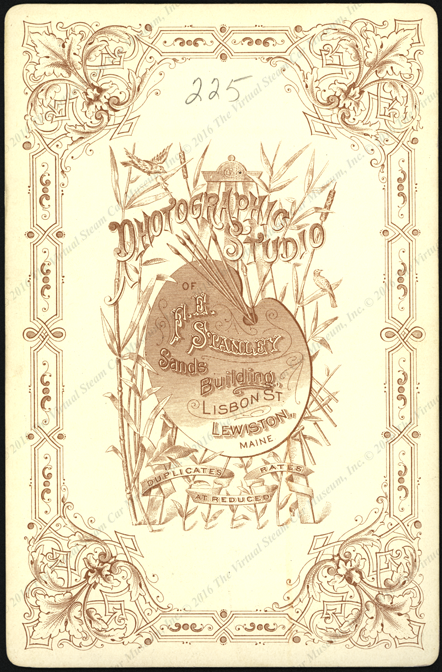 Developing photographs in the late 19th century was a complicated process. 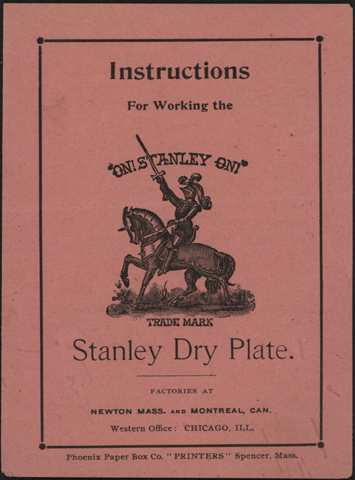 The Stanley's provided their customers with instructions. 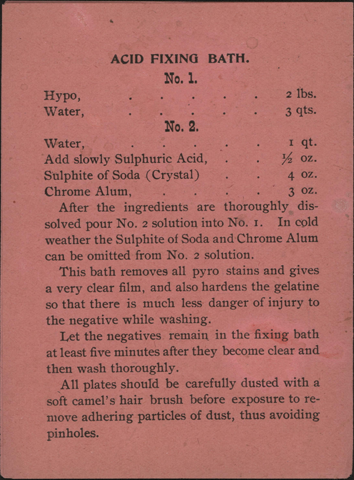 This brochure may have been included in every box of glass plate negatives. This brochure measures 3 1/2" wide x 5" high. 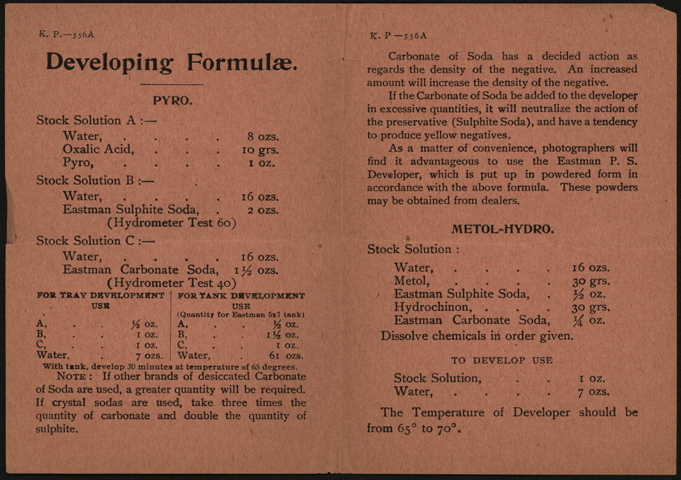 It lists both the Newton, MA and Montreal, CAN factories as well as a sales office in Chicago, ILL. These instructions carry the Kodak name and the Stanley trademark. 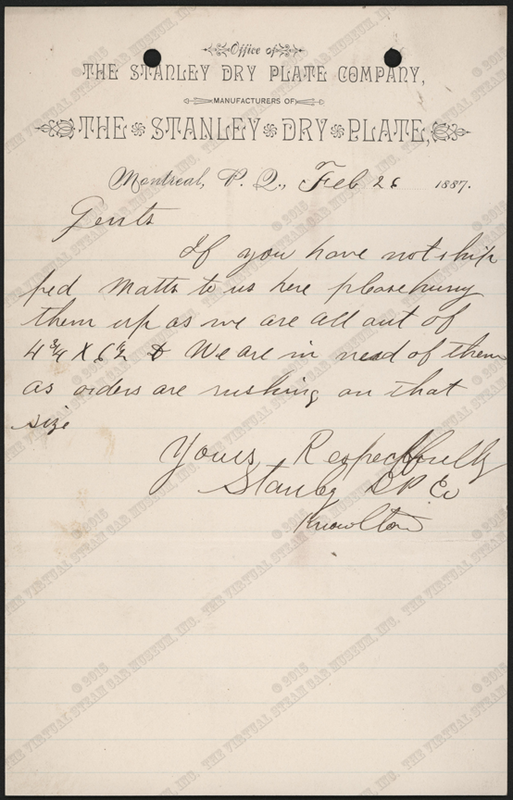 This letter originated in the Stanley's Montreal office on February 26, 1887. 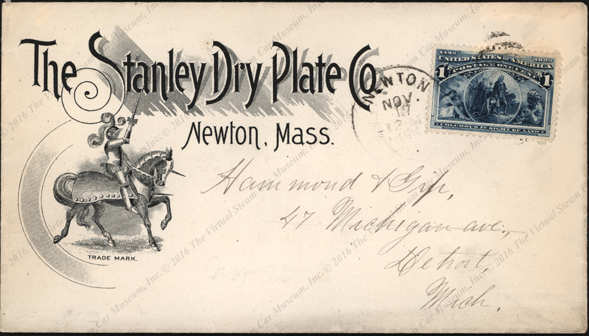 This advertising cover carries a Columbian Exposition stamp, Columbus In Sight of Land. 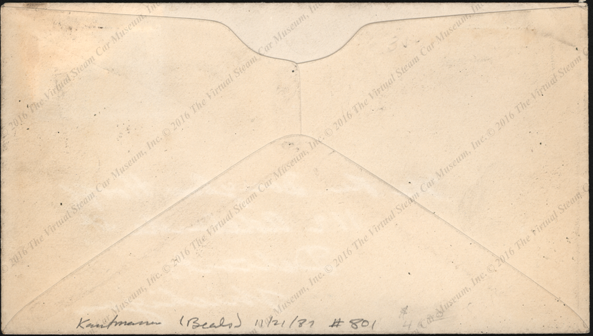 The postmark is poorly struck, but is probably 1894. 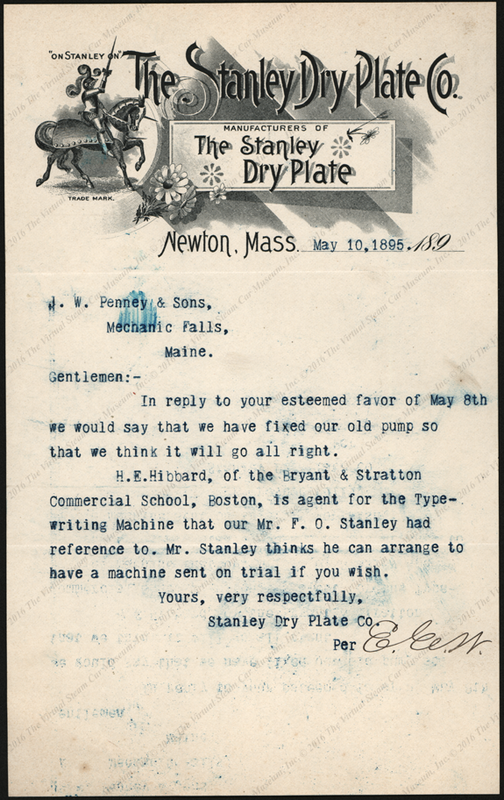 In May 1895, someone at the Stanley Dry Plate Company wrote to J. W. Penny and Sons about F. O. Stanley's typewriter, which he procured from the Breyant and Stratton Commercial school in Boston. 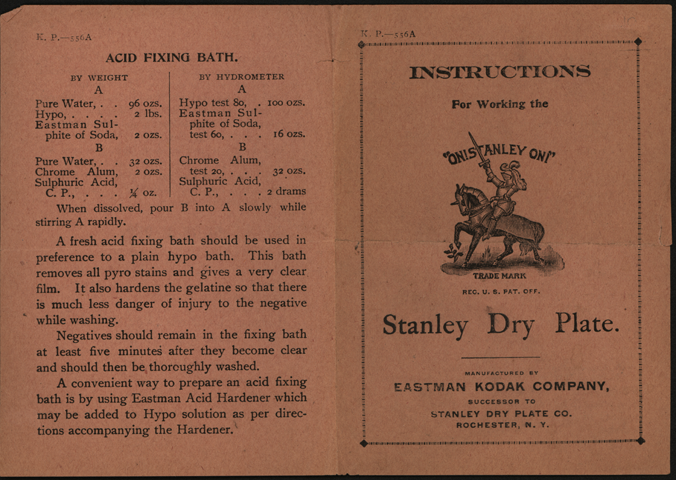 The writer recommended Mr. H. E. Hibbard and suggested that F. O. could have a machine sent to J. W. Penney. 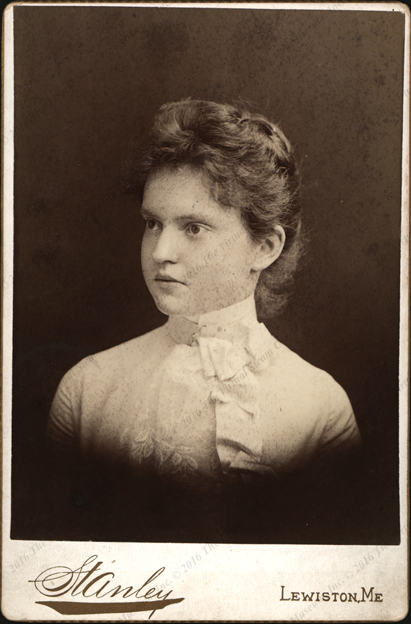 Penney made some of the dry plate machinery and later would participate in the steam car business. 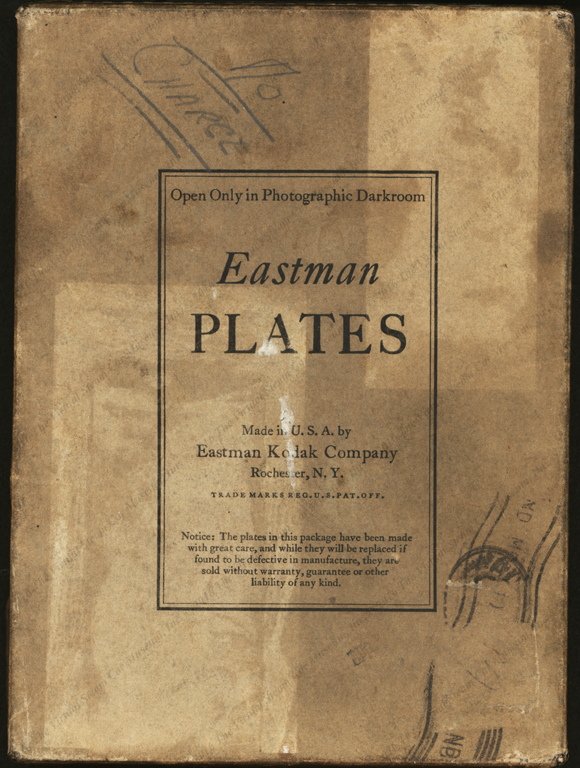 Here are some contemporary Eastman Kodak glass plate negative boxes. Click Here to see more examples. See Foster, Kit, The Stanley Steamer: America's Legendary Steam Car, (Kingfield, ME, The Stanley Museum, 2004), for a history of the Stanley photograhy business. We suggest you buy a copy from the Stanley Museum. Holmquist, Christopher Evan to Donald Hoke, email, Decemer 17, 2017. 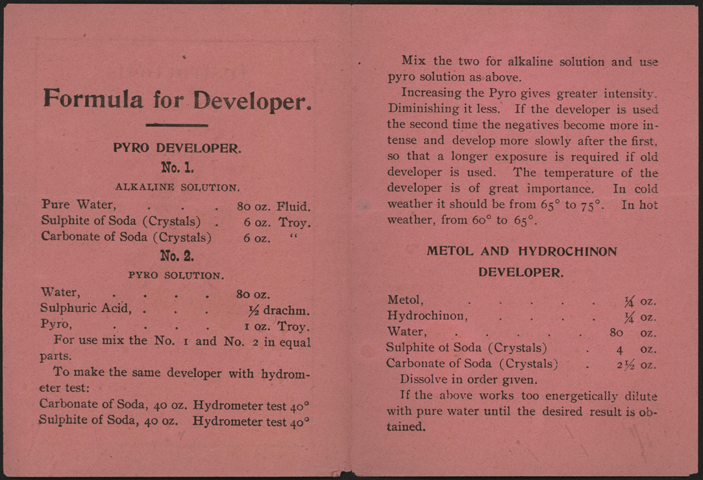 Christopher provided the scans of the patent file. The formal reference is: National Archives at Kansas City: Record Group: 241: Creator: U.S. Patent and Trademark Office Series: Patent Case Files, 1836-1993: NAID: 302050. 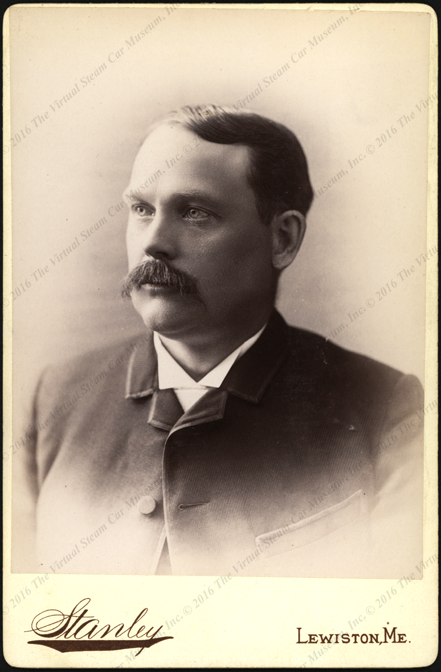 James Merrick to Donald Hoke, email, March 25, 2018. 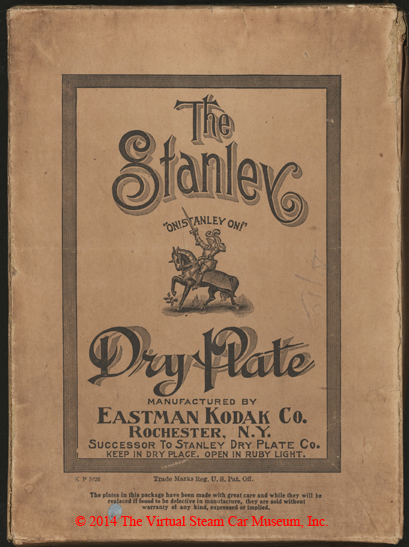 Contact us if you have additional information about F. E. Stanley in Auburn or Lewiston, ME, or Newton, MA dry plate business, or if you have questions.